Help My Poinsettia to Live! 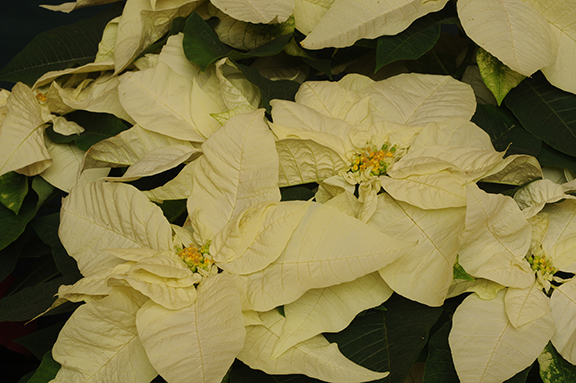 I have a very beautiful white poinsettia gracing my office at the moment. It worries me. I don’t have a green thumb and my previous experience with a poinsettia was dismal. A friend presented me with a flourishing specimen on December 6 one year and by Christmas Eve it had precisely one leaf hanging precariously on the stem. Why then did I decide to have another go? Well, I was sorry for this plant. We had an abundance of them, both red and white, decorating Sacred Heart Chapel, the Gathering Place and the Oratory. After Christmas most of them are taken away and sisters are invited to take one if they’d like to. 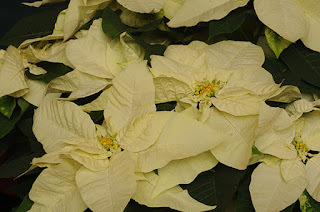 Poinsettias that aren’t claimed go to make compost. And that’s what touched my heartstrings. There were several plants left and I felt I had to save at least one from a freezing death on the compost heap. I took the smallest one available in the hope that it would seem a less overwhelming responsibility. It doesn’t. I’ve had it about a week now. It’s feeling a bit dry and one or two of the leaves are yellowing. I think it needs watering but I’m approaching that possibility with some trepidation as I’m pretty certain the death of my last poinsettia was partly due to drowning. Why am I blogging about this? It’s an attempt to involve you! I’m feeling that if this poinsettia could feel waves of positive thoughts about its survival coming from you, it might give it a will to survive that can overcome the toxicity of my ministrations. I care about my poinsettia, even though I’m not an ideal foster parent for it. Please help my poinsettia to live! A good policy for living is “if you are on to something good, share it.” That’s what we sisters are doing and it even has a name─The School of Benedictine Spirituality. We know it is a good thing because we are living it, Benedictine monastic life that is. The values of this spirituality are so livable–community and hospitality and prayer. Other values like obedience and humility and stability seem reserved to religious life, but really when you understand their meaning you see how each fits in anyone’s life. That learning would be with the course, LIVING BENEDICTINE VALUES. And really this Benedictine way has been around more than 1,500 years; there must be a secret after all. What do 21st century women in Stearns county Minnesota have in common with sixth century Benedict of Nursia, Italy? An insight into that offers an insight to the longevity of the Benedictine way. The HISTORY AND SPIRITUALITY OF THE BENEDICTINE TRADITION course introduces us to the secret. ORA ET LABORA. PRAYER AND WORK. That is the Benedictine motto. It is simple and to the point. There are many ways to pray and the PRAYER AND WORSHIP IN THE BENEDICTINE TRADIITON will look at public and sacramental ways of praying while the course called lectio refers to the individual and personal way of praying. You come away using words like lectio and Liturgy of the Hours (LOH) and the Rule freely and with meaning! 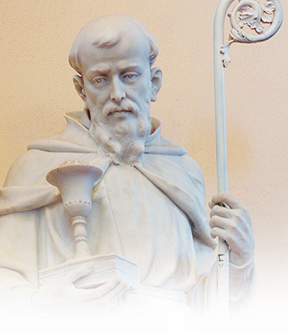 If you are interested in understanding more about Benedictine spirituality, consider participating in the following course at the School of Benedictine Spirituality at Saint Benedict’s Monastery in St. Joseph, Minn. We are now taking registrations. Time: 9 a.m. - 4:15 p.m. 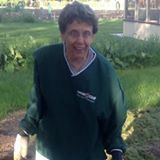 This course, taught by Mary Reuter, OSB, is a prerequisite for all proceeding courses in the School. Learn about The Rule of Benedict as a guide to living a committed life that integrates Gospel values such as prayer, hospitality, community, respect for all creation and beauty. Benedictine spiritual practices such as Liturgy of the Hours, lectio divina and spiritual companioning will be introduced. Fee: $150 Sponsorship opportunities available. We are onto something good – come and share it. My name is Sister Lisa Rose and I entered Saint Benedict’s Monastery in 1983. An interesting fact about me is that my birthday is on the same day on which we make our monastic profession. So for me this meant that it was my twenty-fifth birthday when I made my first profession and when I celebrated my fiftieth birthday it was also my twenty-fifth jubilee. The celebration was two-fold and a wonderful day to be with my community, family and friends. My years in the community have taken me through many different ministries. I started in health care and currently work with our vocation team. As I work with vocations I am asked to tell my story of how I was called to join this community. My story begins as a student at the College of Saint Benedict. As I listened to God calling me to religious life I was confused and questioned, “why me?” The more I dialogued with others, their response was usually: “Oh I knew that.” Why is that I could not see what others were seeing within me? So now that I am a member of our vocation team I will have the privilege of walking with women who, as I was, are sensing a call to religious life. I am grateful for this new ministry, because I believe that as I listen to their stories I will be able to recall my own story. In this way I will deepen my commitment to our community through our common life of prayer and work as together we seek God.